What if the explosion in the economic activity and knowledge work we regard as the Knowledge Age (1980-2010) was almost over and a new economic imperative was suddenly upon us? The Wisdom Age (2010-)?The weak signals from the future point this way. How might such a trend affect the way we think about the world and the new kinds of products and services that people want? And the new kinds of jobs people will do? There have always been wisdom workers. Community and business leaders, ethicists, judges, mediators and spiritual gurus. But the focus on wisdom work has reached a new intensity. There’s a whole bunch of new positions being advertised such as Corporate Ethics Officers, Certified Ethical Hacker, Business Continuity Managers as well as “green collar” work such as Environment Compliance Consultants, Energy Efficiency Engineers, Renewable Energy Coordinators and Ecological Footprint Accountants. Although our scientists, academics and the R&D departments of big corporations are creating new knowledge at an exponential rate, we planetary citizens are increasingly frustrated by the slow speed at which we collectively deal with the world’s most wicked problems. There is now an expectation we must learn to live more lightly on the planet, to reduce our impact on other species, to care more for our fellow citizens, to resolve the issues that divide us.To do this, more and more jobs will be created to wisely apply our knowledge. Paradoxically, we are also creating the tools that will help to automate/democratize this kind of work, so that ordinary people are able to make use of the same kinds of methods that were previously used only by experts. A pioneer in this field is Linda Newman, Associate Professor of Education at Newcastle University in Australia (pictured). Linda is the joint creator of a process for resolving ethical dilemmas known as the Ethical Response Cycle. A version of her method is included in her own electronic meeting title Working Wisely that can be used by anyone with less than a day’s facilitator training to explore and resolve complex ethical issues with greater certainty. 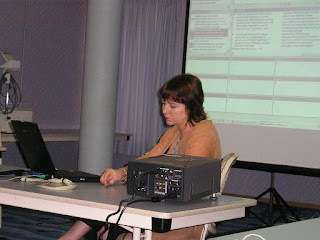 Linda uses her method to help early childhood teachers and carers develop professionally. Participants learn about the ethics by observing and sharing their own reactions to a hypothetical dilemma and making sense of the patterns in the group’s responses. The dilemmas are presented as a series of “guided discovery questions” that take participants on a learning journey. Each step of a complex case study is followed by a more impossible dilemma or unexpected scenario that needs to be resolved. Participants engage in a type of high level discussion which Linda calls Ethical Dialectical discourse, which must not only resolve the conflict’s between indvidual opinions, but must also satisfy a personal, professional ethical standard or legal requirement. 1. A friend comes to tell you that they have discovered that the automatic teller machine in your town is somehow making errors in calculation. Every withdrawal is receiving $20 too much without the client’s balance showing it. What do you do and why? 2. 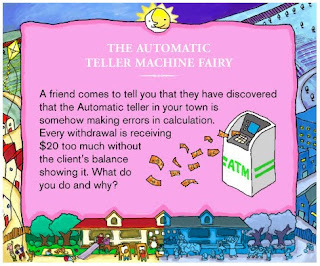 The “Automatic Teller Fairy” has been helping out many people in your town for a week now. Word has spread. The error has been discovered and rectified. The Daily Bugle reports the names of everyone who used the teller and how often. Your mother (or someone you respect) calls you to talk about it. How do you feel about what you decided to do and why? 3. How do you feel when your employer raises the issue the next day, and why? 4. What does this story have to do with ethics, and why? 5. Some people returned to the teller many times. Write 25 words about how they were thinking. 6. Some people reported the mistake and returned the money. Write 25 words about the type of thinking they used to inform their decision to return the money. 7. Some people who had very little money used the machine only on days where they really needed it. Write 25 words about the type of thinking they used to decide when to, and when not to, access the machine. 8. We have been talking about ethical perspectives which have theories to explain them. Sum up the ethical issues in this story. We, hologram Goodbye "Cowboy Culture"